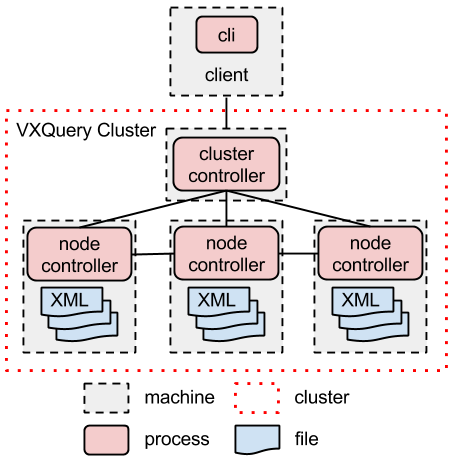 The VXQuery cluster is made up of two parts: a single cluster controller (cc) and many node controllers (nc). The VXQuery CLI is used to parse the query and compile the job for the VXQuery cluster to process. The CLI passes the job to the cc which manages the job and returns the result to the CLI. The following diagram depicts the cluster layout. The XML document are distributed between the ncs. The query's collection function will identify XML file path for the ncs. Create a configuration xml file containing the information of the vxquery cluster.Here is an example of a VXQuery configuration file for a cluster with 1 master and 3 slaves. username : user that will execute commands in all the machines of the cluster. Preferably a user that has passwordless ssh access to the machines.